Inder Loves Folk Art: One month! A couple months ago, fellow blogger Laura posted this awesome First 12 Month Baby Vest Set on her sewing/crafting/baking blog, Craftstorming. I loved this idea, but not having a digital cutter (or even a decent computer printer!) it probably wasn't going to happen at my house. So you can imagine how pleased I was when the super generous Laura made me my own set of iron-on transfers and sent it all the way from England (in the middle of the Olympics, no less)! She also sent detailed instructions on how to successfully iron on the transfers, which made the process easy, fast, and foolproof (especially important given that I am stuck under a baby most of the time and can only work in very short bursts during Maggie naps). 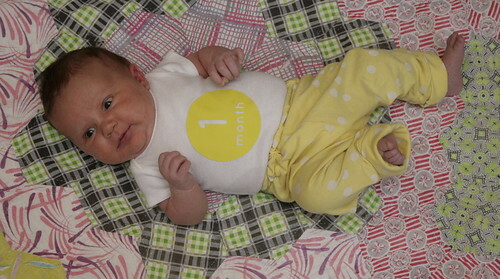 Month 1 is paired with yellow polkadot Knit Newborn Pants. Maggie has finally grown into her handmade newborn pants! (Well, I still have to fold up the bottoms a little bit.) And yes, that's Christine's quilt again. What can I say? It's my favorite backdrop for baby photos! * I know. 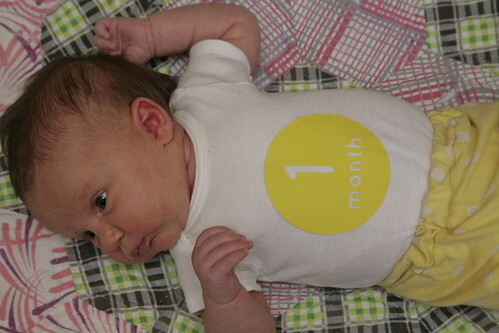 I can't believe she's one month old already! Oh, she is just adorable! I just want to eat all of her baby goodness up (but not in a creepy way)! I love her and those yellow polka dot pants! How much is she looking like Joe, eh?? For real. I look at photos of Joe at this age, and they are two peas in a pod. But I do think just maybe she favors my side of the family a bit more? Yeah, probably not. Sigh. Baby Nora must be here by now!! Can't wait to "meet" her! I remember feeling that way when Joe hit about a year. One great thing about baby # 2 is that I know that will come. Which helps me enjoy the baby fog a bit more. Oh she's BEAUTIFUL and I love her polka dots and her little top! congratulations! She's so cute, look at those chubby cheeks. I love the co-ordinating pants. I'm really pleased you're going to be able to use these stickers, I do wish I'd see it early enough to do it with my two. What a great idea! I tried to take monthly pics for my first child but sadly they fell by the wayside after several months :-( Needless to say my younger 2 had NO monthly pics at all. Oh dear. Your Maggie looks gorgeous in it, by the way. Oh, my gosh, the cute! !